The Newark Business College was founded in 1881 with the basic principle of honesty and work well done. How well it has stood the test is a matter of common knowledge. For many years after its inception it was under the direct personal charge of W. W. Winner, one of Newark's most widely known and best loved citizens. During the period of his supervision, it developed from a small but good school into one of the largest and most highly efficient schools in this section of the country. Following his death in 1908, the school was incorporated, with his estate holding the controlling interest. 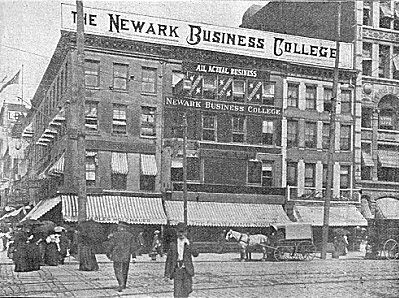 Its standard has been maintained through this period of reconstruction, and with high ideals, conscientious motives and the personal interest of the student always a vital factor, its friends and patrons can have the satisfaction of knowing that it still, as in the past, merits the appellation of "Newark's Leading Business School." The Newark Business College is located at the corner of Halsey and Warren streets, adjoining the YMCA within easy access of the business center of the city. It is one block from Broad Street and two blocks form Market Street, making it convenient of access to all local and suburban car lines. It is also within easy walking distance of the various railroad stations which is on special advantage to those out of town students who use the trains in going to and from the school. The school has two entrances, one of Warren Street and the other at 105 Halsey Street, thus affording convenient and easy means of ingress and egress. The day school receives light from four sides thus affording the best opportunity for proper ventilation, while the night school is lighted by the well known tungsten electric lamps which furnish the nearest approach to daylight known to science. This is without doubt the best lighted and best ventilated school in Newark. The day school begins on the Tuesday of September following Labor Day and is open throughout the year. The evening school begins the first Tuesday in September. Sessions are held from 7:15 PM to 9:15 PM on Monday, Tuesday and Thursday of each week. It is often said the success of a school is measured by the success of its graduates, but another essential element is the confidence reposed in it by the business public. This the Newark Business College has to a marked degree.